The present rage for sashes has created an immense demand for fringes. Fringe-making by hand is an ancient and artistic pursuit, quite as worthy of cultivation as knitting or embroidery. It only takes a small quantity of fringe for the ends of a sash, so that any lady who feels disposed to try fringe-making can soon see some reward for her labor. If she cares to carry her experiments further, she may have as a result cream-white fringe suitable for infants’ cloaks and coats; or black and colored, adapted to the decoration of silk or woolen costumes. Although the process of fringe making may be considered tedious by some, when once done, the trimming lasts for years. Several simple effective ways of making fringe will occur to any lady at all ingenious with crochet hook and needle. What she particularly wants, just here, if she wants anything, is a few hints as to starting. The fringe proper is knotted into the heading after the latter is finished. 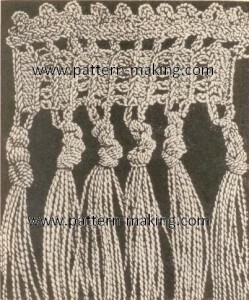 There are various styles of knotting, which may be copied from ready-made fringes. In a really good fringe, although the heading may be executed by machinery, the knotting is done by hand. This is why a good fringe is an expensive article in the first place, although it may prove cheap in the end by lasting much longer than common varieties. 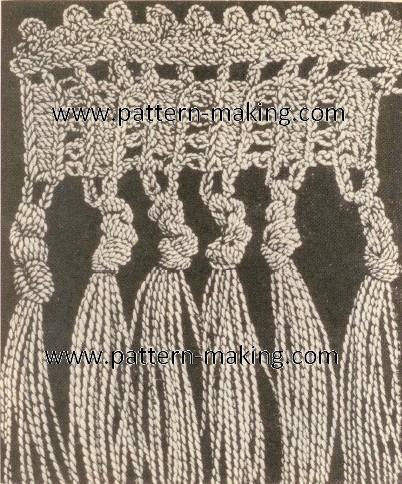 For an artistic handmade fringe, the heading may be crochet work, macrame or mignardise of the style popularly known as “hairpin” work, while tatting or pointlace stitches may be introduced to help out the design. This last may be as elaborate as one pleases, but a simple pattern will furnish quite as much work as the average woman would care to under-take, and it may be made quite as effective. The following pattern will be found excellent for practice. Make a chain of 17 stitches. 1ST ROW: Turn, skip 9 stitches, work 8 double crochet stitches in the next 8 of the chain. 2D ROW: Ch 3, 1 dc in 2d dc of preceding row, taking the back of the loop. * Ch 1, skip 1 dc of preceding row, work 1 dc in next dc. Repeat from * twice, or until 4 dc in all have been made. 3D ROW: Ch 9, work 8 dc in stitches of preceding row. Repeat 2d and 3d rows, until a strip as long as desired has been made. To make heading of heading, begin at the end last made, and work lengthwise. Fasten thread to last dc of 8 dc last made. Chain 5 to start with. FRINGE WITH CROCHETED HEADING1ST ROW: 1 dc in same stitch as base of dc last made. Ch 3, ‘skip open-work row, 1 dc in top stitch of next dc (in solid row, along upper edge, of course). Ch 3, 1 dc at base of same dc, etc. Repeat, working 1 dc on the line between solid and open rows, all along to end. 2D ROW: Fasten thread anew, and work in same direction as before, 1 single crochet in every stitch of preceding row. 3D ROW: Between every 2 dc of 1st row, work 3 dc in 3 sc. Over every dc of 1st row, make 1 picot formed by chaining 5. Skip the 1 sc under every picot and over every dc below it. Of course the thread should be fastened anew, and the work proceed in the same direction as the 2 preceding rows. On the lower edge of the complete heading hangs a row of loops, each loop composed of a chain of 9. In these loops the fringe is to be knotted. For each tassel, take six (6) strands of silk, each about 6 inches long. Pass the whole bunch through 1 loop and double evenly. Tie the 2 ends together tightly, with 2 knots close to the loop. Then take the whole 12 ends at once and make 1 large knot, as close as possible to the smaller ones just made. When all the tassels are finished, clip the ends evenly.